By rotary cutting 2.5 inch strips from my leftover City Weekend fabric scraps, sewing a 1.5 inch strip of white fabric to the length of the first strip, and cross cutting this strip into 2.5 inch units, this quilt comes together really quickly. Arrange the two-piece units at random and sew together into rows, then sew rows together. Lots of strip and chain piecing. A wavy line of running stitches - one of the decorative stitches on my sewing machine. This was so easy and fun to do, I didn't have to move the fabric from side to side to create the wavy line, instead the needle changes position with every stitch. And another deviation from RPQ "standard practice": a stripey binding. The color match was perfect and I couldn't resist this cute combination. I've never thought to use a decorative stitch for quilting. Great idea! As usual, it's just gorgeous! Somebody's going to have a lucky baby!! gorgeous, i love it- and totally love the idea for quilting- will have to try! I love that quilting! I've been doing straight-line quilting on a queen-size quilt and going crazy because it's not looking nice and straight like yours. Then I see these gorgeous, even, perfect waves and I'm ready to cry. Thank God you said it's a decorative stitch. I don't feel like such a failure, lol! Your quilts never cease to amaze me....... another very beautiful quilt! I am going to have to try this one - so simple, and so lovely. this is gorgeous...i love the wavy line! It's awesome, just like everything else you do! 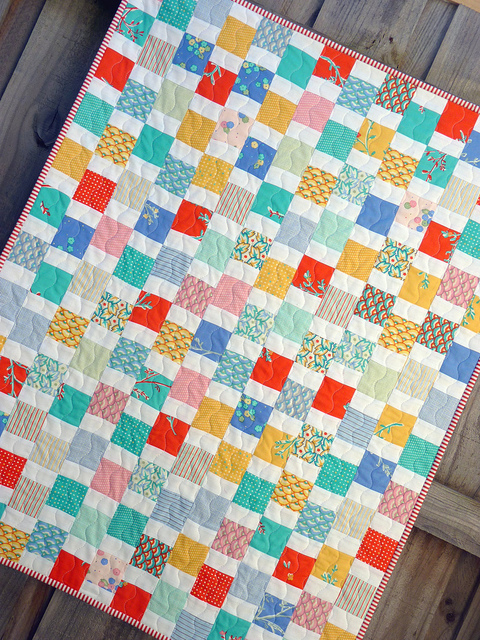 I L O V E the quilting on this one! I love this quilt design. Thanks for sharing it. 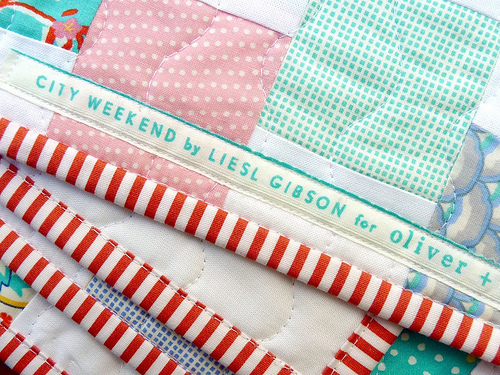 Love this quilt Rita! Could you tell me the Bernina stitch you used for the wavy line? It may help me with one of my quilting projects. Thanks! Lovely quilt - love the wavy lines! That wavy stitch is fabulous. Am loving that fabric, especially the aqua coloured ones. Beautiful work, Rita. Hi there - lovely quilt & great stitching - can you tell me if you used the walking foot with your machine or just the standard foot please? Many thanks. You are really prolific and always they are so pretty. I love that quilt! It's so beautiful! What kind of sewing machine do you have? I wonder if my plain jane sewing machine would do something like that for the quilting. sheesh! you are just amazing! i am loving those wavy lines. perfect for the fun prints you used for the quilt! I agree with so many others...love the quilting! I have had a stacked coin quilt top done for months now. I want to finish it for part of my daughters Christmas present, but was undecided about how to quilt it. Not a big fan of stippling (probably cause I stink at it!). Now I have found something that may be just perfect! Thanks so much for the inspiration! You make it sound very easy! its absolutely pretty. My first thought was that I couldn't see a straight line in the quilting. I'm shocked! it looks great. That stitch always makes me want a Bernina. Or do you have a different machine that does that? LOVE the binding and LOVE the quilting technique. everything you make is amazing! Nice quilting! Rita.Happy to be back to see you blog. That is really cute, I wish my sewing machine could do that! Wow! It's so different from the straight line quilting. The final look is more organic, without having the look of a free quilting. I can't say if I like it better or not, but it is so different! Gotta try the ideea with the white strips, thanks. 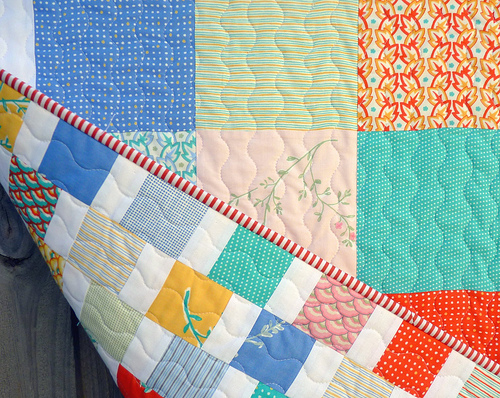 I just love your quilts and your blog, so inspiring! I have been following for quite a while now and you always have such fresh and beautiful quilts. I recently started my own blog and I have linked your blog to mine. Hope you'll take a peak. Thanks! Beautiful quilt! 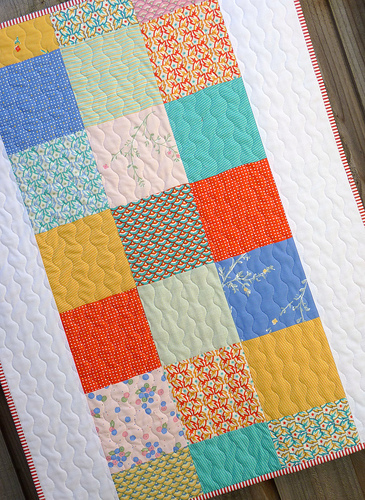 This quilt design would be perfect with a jelly roll, or using scraps from a jelly roll. I love how you broke up the stacked coins with the solid white fabric. Another stunner! Oh, my! 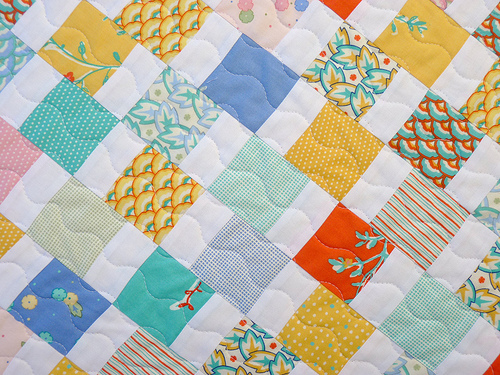 What's not to love about this adorable baby quilt? The wavy quilting and the pieced backing have me swooning. I thought I posted this question but maybe it didn't go through. What I wondered is, do you know if the Janome 6600P has that stitch? I think you used to use that machine before? I love this quilting so much more than plain straight lines. thanks! Love the wavy stitch idea. I could probably do this, even though I am a beginner. I have that stitch on my machine. Thanks for the idea.